Find a therapist in California with GoodTherapy.org. According to the Gallup-Healthways Well-Being Index, California ranked as number 18 for overall well-being; the survey rated emotional health, work environment, live evaluation, physical health, healthy behaviors, and basic access to things like health insurance, food, and shelter. For example, the study showed that 55.5% of the state’s 37.2 million residents exercise frequently, and 58.6% eat produce regularly. 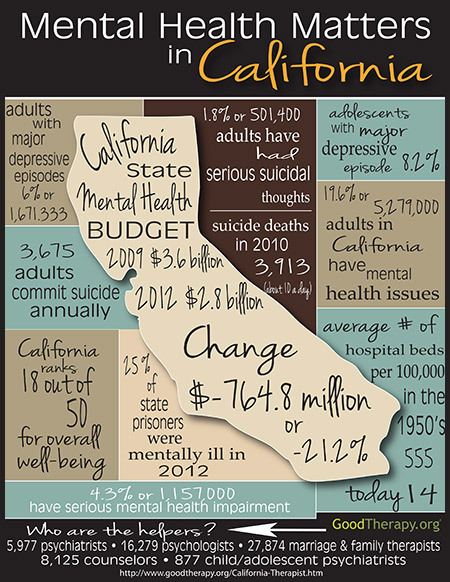 As for mental health statistics, California falls in line with national averages: 19.6% of adults live with some kind of diagnosable mental health condition, and 4.3% of residents are impaired by a serious mental health condition. Six percent of adults experienced a major depressive episode over the course of a year, and this number, too, is consistent with the national average of 6.7%. Serious suicidal thoughts affected 1.8% of residents, and .01% of Californians died by suicide. Major depression impacted 8.2% of adolescents in California. Unfortunately, between 2009 and 2012, California’s mental health budget plummeted by $764.8 million, or 21.2%, reducing access to mental health services for residents. Indeed, over the decades, funding for mental health has declined severely; in the 1950s, for example, California provided an average of 555 hospital beds per 100,000 residents, and this number has been reduced to just 14 beds per 100,000 residents today. However, there are many people, groups, and organizations working to improve mental well-being in California. For example, in 2013 an organization called Directing Change conducted a statewide student video contest in an effort to prevent teen suicide, eliminate stigma related to mental health conditions, and promote student wellness. Students submitted 60-second videos in two categories: suicide prevention and eliminating stigma. From 371 entries produced by 922 students, three winners and one honorable mention were selected in each category. Funding for the project was provided by the voter-approved Mental Health Services Act of 2004 (Proposition 63), which levied a 1% income tax on personal incomes in excess of $1 million to help fund mental health services across the state. Additionally, there are a large number of mental health professionals serving state residents. In California there are 5,977 psychiatrists, 16,279 psychologists, 27,874 marriage and family therapists, 8,125 counselors, 19,359 social workers, and 877 child and adolescent psychiatrists according to figures from 2012.